Honda has spent years developing the technology making up the new VFR1200F – some of it will only be making an appearance on future versions – but this is the first close look at the technology of the bike. There were several major challenges in getting the V4 ready for production, and reducing vibration was key. As a result a revised cylinder layout was developed. 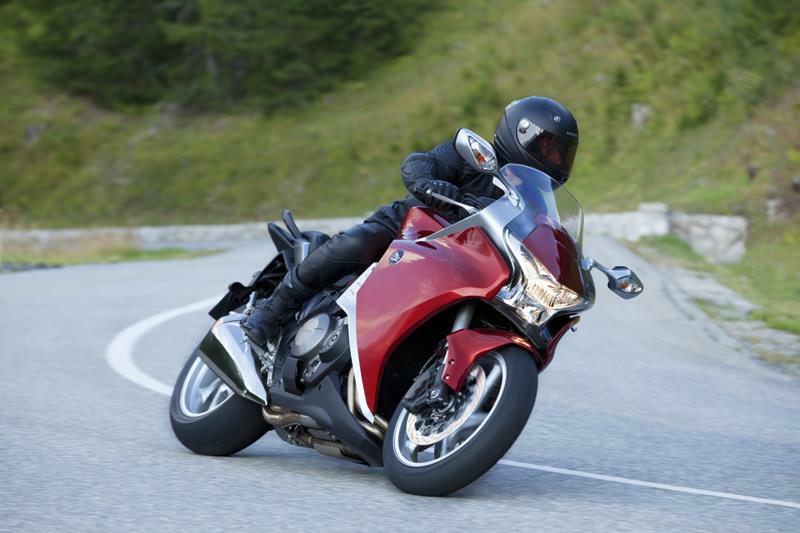 Instead of a traditional V4 with evenly-spaced cylinders front and rear, the VFR1200F has a solution that not only reduces vibration but centralises mass and allows a more comfortable riding position. Honda is using a new version of the PGM-Fuel Injection system with electronic control of the throttle – a first for Honda – to give precise fuel metering. The Japanese manufacturer claims this gives a greater feeling of control. The VFR1200 has a similar slipper clutch to the Fireblade to prevent the rear wheel locking-up under rapid downshifts. Honda claim the all-new shaft-drive system prevents the usual torque reaction suffered by conventional set-ups. It uses an offset propshaft and a constant velocity joint, but Honda has yet to reveal exactly how the system works. More news next week. The bike is extremely narrow in the middle because of the shape of the engine. This allows the rider to sit in, rather than on, the bike with a low enough seat height to let the rider put both feet on the ground says Honda. The Honda Dual Clutch Transmission (DCT) uses two separate clutches for odd and even gears with gears changed without interrupting power by applying the engine's drive to the next gear just as it is being disconnected from the previous one. This enables quicker and smoother gear changes and delivers better fuel economy while reducing emissions. This system shuts down cylinders firing as and when they are not needed to improve fuel efficiency and reduce emissions. The VFR1200 is unlikely to get this system in the near future but it will be seen on the new PanEuropean which is scheduled for 2011 and uses the V4 engine as the basis for a much bigger touring motorcycle with a much less sports-orientation.